The specs are for Optane memory H10 with solid state storage, a hybrid solution. Arif Bacchus explained the combination further in Digital Trends. "The Optane and QLC 3-D NAND drives won't appear as separate on your PC. Instead they will be combined and will appear as if you had a single solid state drive installed. Intel's driver software will manage the relationship between the two drives in the background. You'll notice better performance without having to manage each drive." Joel Hruska, ExtremeTech, welcomed the idea. "Using Optane to accelerate rather slow (but cheap!) NAND is a novel idea, and the use of an SLC cache on the same drive should ensure that even after you run out of Optane, you can maintain suitable performance for a longer period of time." Translation, please? We are looking at a 2-in-one deal. Brandon Hill in HotHardware: "Enter Optane Memory H10, which is a new PCIe 3.0x4 NVMe-based 2-in-1 storage 'gum stick' that combines Intel's ultra-fast Optane memory with the company's QLC 3-D NAND." According to the company, "The combination allows Optane memory expansion into thin and light notebooks and certain space-constrained desktop form factors – such as all-in-one PCs and mini PCs. The new product also offers a higher level of performance not met by traditional Triple Level Cell (TLC) 3-D NAND SSDs today and eliminates the need for a secondary storage device." Hill assessed the announcement: "The key breakthrough is to be able to fit all of these components into a single M.2 device instead of needing two M.2 connectors – which can be a challenge for space-deficient ultra-portable notebook designs." Bacchus in Digital Trends: "Put simply, it's a small Intel Optane drive combined with a much larger Intel solid state drive. In other words, "The combination of high-speed acceleration and large SSD storage capacity on a single drive will benefit everyday computer users, whether they use their systems to create, game or work." One can get faster access to frequently used applications and files and better responsiveness with background activity, said Intel. Intel noted the speed gains in its April 10 news release: Launches documents up to 2 times faster while multitasking; launching games 60 percent faster while multitasking; and opening media files up to 90 percent faster while multitasking. 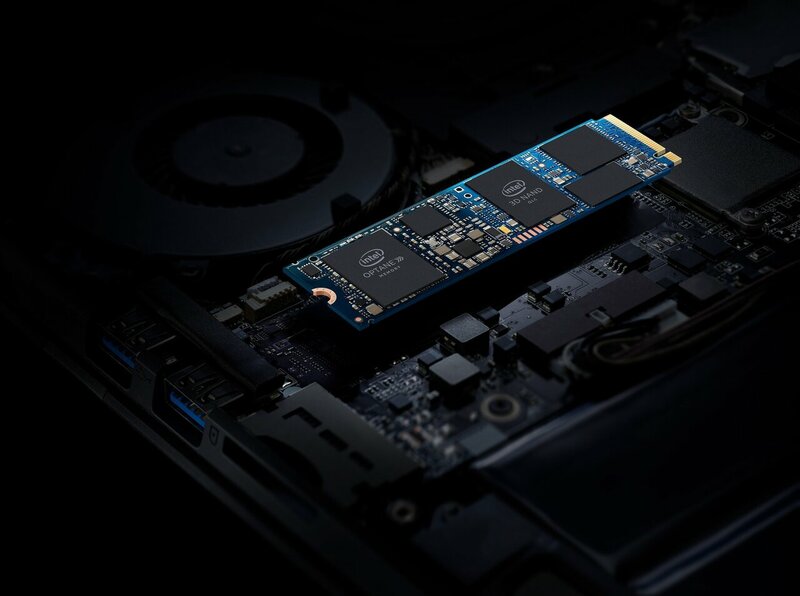 "Intel's Optane technology leverages caching technology and is able to provide much faster read and write speeds than the fastest solid-state-drives currently available in the market," said Bacchus. Here is the schedule. Platforms featuring Intel Optane memory H10 with solid state storage will be arriving through major OEMs this year. In another newsroom page, Intel explained why it refers to the Optane and 3-D NAND technologies as the dynamic duo. "Intel Optane technology drives improvements in real-time data analysis, while Intel 3-D NAND delivers faster access to large amounts of data. These two technologies are the dynamic duo of memory and storage." They fight through bottlenecks with factors including responsiveness and large-capacity storage.